Via Verde, a largely City-financed project that blends 151 rental units and 71 co-op units with innovative and sustainable green design elements, was the winning proposal to New York City’s first juried design competition for affordable and sustainable housing, the international New Housing New York Legacy Competition. Via Verde is an affordable residential development comprising apartments in three distinct building types, a 20 story tower at the north end of the site, a 6 to 13-story mid-rise duplex apartment component in the middle, and 2 to 4-story townhouses to the south. 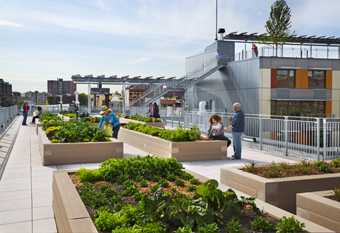 A dynamic garden serves as the organizing element for the community. The garden begins as a ground level courtyard and then spirals upwards through a series of programmed, south-facing roof gardens, creating a promenade for dramatic views. The multifunctional gardens create opportunities for active gardening, fruit and vegetable cultivation, recreation and social gathering, while building takes the form of a “tendril” rising from grade to the tower, enclosing the courtyard and emphasizing a relationship to the natural world. Community gardening plots encourage residents to grow fruits and vegetables. 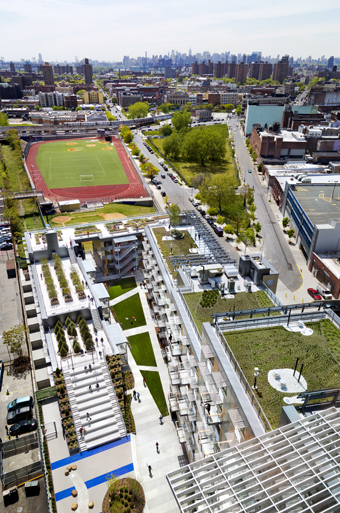 : Photograph © David Sundberg/ESTOThe rooftop gardens dissipate heat and absorb rainwater runoff, using a reclamation system that recycles water for irrigation. A main point of entry leads to residential lobbies and townhouse entries health center, and live-work units, creating a lively street presence. Above the main entrance overlooking the street and courtyard are resident community spaces including a fitness center. Totaling 300,00 square feet (sf) with 277,000 sf residential, 7,500 sf commercial/ community and 40,000 sf green roof space, Via Verde will set new standards for the sustainable design of affordable housing. The complex is designed to achieve LEED NC Gold certification. Via Verde is designed to promote a healthy lifestyle and create a vibrant community environment. Stairwells with natural light are easily accessible, promoting wellness and encouraging regular use for physical activity. Cultivating the development of community and pride of place, Via Verde has reserved its premium space, the penthouse floor of the tower building, for the community common room, open to all tenants. Via Verde’s design, incorporating a shared courtyard and large windows, promotes cross ventilation between two outside exposures – increasing the natural circulation of fresh air in the homes and reducing reliance on air conditioning. Energy saving and sustainable features designed into Via Verde include motion sensors in stairways and corridors to conserve electricity and building-integrated photovoltaic panels to produce electricity from solar energy. Bedrooms and living rooms have ceiling fans. Energy saving and sustainable features: designed into Via Verde include motion sensors in stairways and corridors to conserve electricity and building-integrated photovoltaic panels to produce electricity from solar energy. 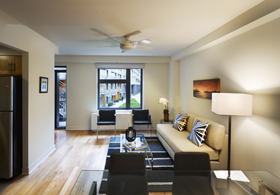 Individual apartments feature EnergyStar appliances, energy-efficient lighting, panoramic, high-efficiency windows, natural cross ventilation in all duplex apartments, Low VOC materials improve air quality, super-sealed insulation, and water-conserving fixtures. 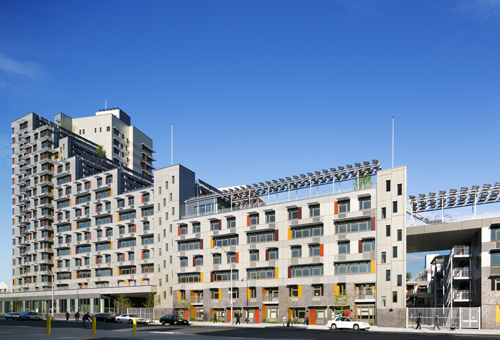 Photograph © David Sundberg/ESTOIndividual apartments feature EnergyStar appliances, energy-efficient lighting, panoramic, high-efficiency windows, natural cross ventilation in all duplex apartments, Low VOC materials improve air quality, super-sealed insulation, and water-conserving fixtures. Photovoltaic panels provide solar energy to Via Verde and are incorporated into the design of the beautiful outdoor pergolas and south facing facades, introducing the materials into the everyday lives of all residents. In keeping with Via Verde’s mission as a model for healthy, sustainable living, Montefiore Medical Center will open a comprehensive family practice at Via Verde in the fall. Staffed with four full-time family medicine physicians, nurses, support staff and a social worker, the 5,000-sq. ft. practice is projected to deliver over 15,000 visits each year to approximately 6,000 patients. There is an additional 2,000-square-feet of retail space as well. Apple orchard farm accessible to all residents. : Photograph © David Sundberg/ESTOA “Green Living Guide” will be given to each resident with information on how to promote energy optimization and green, healthy living. “Via Verde’s mandate for healthy living in affordable housing inspires not only a place to live, but a way to think. Grimshaw is grateful for this inspiration, as well as the opportunity to collaborate on such a notable project with Phipps Houses, Jonathan Rose Companies, Dattner Architects, and the entire project team. 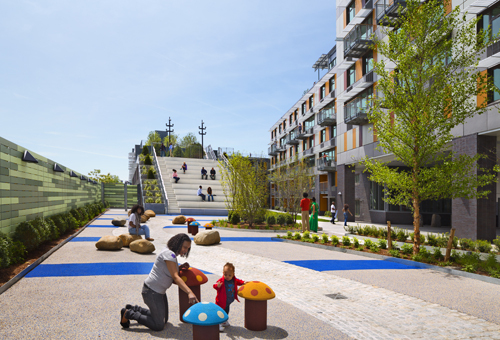 We sincerely hope the efforts put forward will enrich the lives of its residents, the community, and the future of affordable housing,” said Virginia Little LEED AP, Architect, Grimshaw. 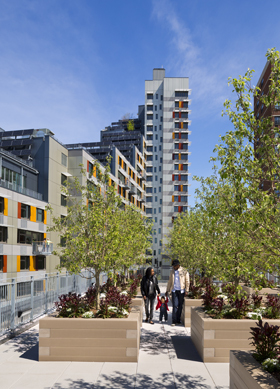 “Via Verde realizes a vision for innovative, sustainable affordable housing in the South Bronx. 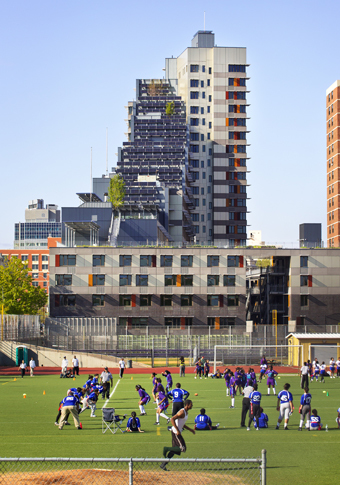 Dattner Architects is honored to be part of the team … to create this community inspired by the integration of nature and city,” said William Stein FAIA, Principal, Dattner Architects.